Ulaanbaatar is the capital city of Mongolia, located on the bank of the Tuul River and surrounded four sacred mountains. The city was founded in 1639. The name of the city has changed for several times. It was initially named Urguu in 1639-1706, Ikh Khuree in 1706-1911, Niislel Khuree in 1911-1923 and renamed as Ulaanbaatar right after the proclamation of the Mongolian People’s Republic in 1924. 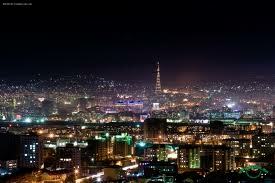 Today Ulaanbaatar is the political, economic, cultural and scientific center of Mongolia. Ulaanbaatar is the main gate for trips to any destination in Mongolia. Well-known as a sunny, peaceful and open city, Ulaanbaatar is a city of contrasts where modern life comfortably blends with Mongolian traditional lifestyle. 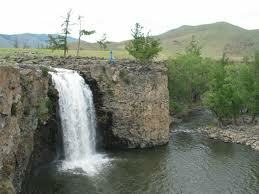 Terelj National Park is an exhibition of steppe regions of the southwestern part of Khentii mountain range. In 1993, the Gorkhi-Terelj area was protected as a National Park, especially because of its natural scenic beauty it has been used as a tourism destination by both Mongolians and foreigners since 1964. It’s a rather mountainous area with a beautiful river, forests and some interestingly shaped rocks. The beautiful, mostly unspoiled natural area is a popular place to go for a picnic or spend the weekend for Ulaanbaatar’s residents. Good for walking, star watching, rafting, mountain climbing also. Terelj is located in 70km from Ulaanbaatar. Turtle Rock – One of the unusual formulating rocks is the Turtle Rock, or called Melkhi Khad by the locals, is an interesting rock formation looking like a turtle. Gobi Desert is a land of dinosaurs and it is the home for camel breeders. It is rich with wildlife and vegetation. The places, Khongor Sand Dunes, Bayanzag Flaming Cliffs with dinosaur fossils, Eagle valley (Yol Am), and Gurvansaikhan (three beauties) mountain are unique world. There are rare animals- Mountain sheep, Snow Leopard, Ibex and Wild Bactrian Camel (two-humped) in the Gobi. Temperatures reach +40° C in the summer and -40 in the winter. Gobi is southern part of Mongolia and located in distance of 560 km from Ulaanbaatar. 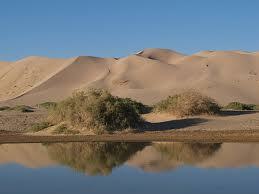 Khongor Sand Dunes (Khongoryn Els) is Mongolian largest sand reaching a height of 800 meter in some highest areas. The sand dunes in Servei sum, South Gobi province, are called Khongoryn Els. These dunes are 20km wide and 100km long. Khongoryn river flows along the sand dunes and gives birth to oasis. Bayanzag Flaming Cliffs is one of the famous places, bottom of Ancient Sea which excited 60-70 million years ago where a lot of palentological findings have been discovered such as dinosaur fossils. The Gobi bears which are very rare animal can be seen in this area. 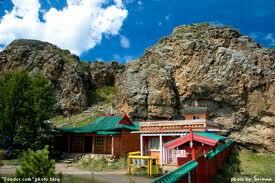 Gurvansaikhan Mountain consists ofthree rocky hills, the highest of 2815 meter above the sea level. The Eagle valley is 62 km north-west of Dalanzadgad, very wide entrance, it narrows gradually into a remarkable gorge. A spring 2 or 3 km long winds its way through the defile and in July, freezing into thick corridor of ice that stretches in along a considerable distance. Following the canyon to the high rock walls has breathtaking dramatic scenery and no doubt is one of the most beautiful places in the country. Kharakhorin In 1220, Chinggis Khaan established the capital of Mongolian Empire on the fertile plains along the Orkhon River. This is called Kharakhorin, 370 km from Ulaanbaatar. Kharkhorin was a busy spindled city with high civilization built by the best artists and masters of antiquity. However, it was completely destroyed in the fierce battles of the internecine war. Quite surprise for the scientists was the discovery of a burial of Mongolian women which dates to approximately the 14th century were also two Egyptian masks, a wooden comb and bronze mirror in a case were found-shows ancient relationship between the nations. The foundations of Karakorum’s buildings are all underground and little has been excavated, so you need lots of imagination when contemplating the grandness of it all. The plain was littered with bricks, ruined walls and pillars until the mid-16th century. The stone, blocks and other building materials from ruins of Kharkhorin were used in the construction of this monastery. Erdene Zuu Monastery – The First Buddhist Monastery called Erdene-Zuu was built in 1586 by Avtai Sain Khaan on ruins of Kharkhorin and housed 10 000 Lamas (monks) in 62 temples. The monastery occupies an area surrounded by a stone wall with 108 stupas lining on it. The Erdene-Zuu monastery preserves marvelous works of Mongolian artists, painters, cutters, sculptors, embroiders and craftsman of the XVII-XIX centuries. 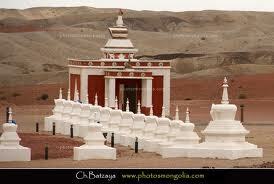 Erdene zuu Monastery was destroyed by communists in 1930s during the political purge. Surprisingly, many Buddha images and statues and tsam mask were saved by locals. The monastery was closed until 1965 and reintroduced as a museum to public. After democratic revolution in 1990, religious freedom was restored and monastery became active again. 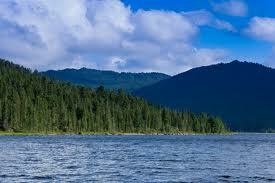 Khuvsgul Lake is located in the northern of Mongolia and 780km from Ulaanbaatar. This is the deepest lake in Central Asia and the world’s 14th largest source of fresh water. Covering in area of over 2620 sq km, 134 km long, 39 km wide, 262 ms deep and lake’s crystal clear water is surrounded by forested mountains. It’s full of fish and the area is home to sheep, ibex, bear and moose, as well as over 244 species of birds and 750 species of plants. There live very unique forest nationalities called “Tsaatan”, who are living in branches tent in the deep forest and taking care for reindeers. Kazakhs live in Bayan-Ulgii province and located in distance of 1636km from Ulaanbaatar in the west Mongolia. Kazakh nomads have lived in the mountains and valleys of western Mongolia with their herds since the 19th century. Until 1930, the nomads could freely move between Kazakhstan, Mongolia and the Chinese province of Xinjiang. However, after the foundation of the Mongolian People’s Republic in 1921, many of the Kazakhs left their semi-nomadic lifestyle and began settling down in the western Mongolian highlands. The Kazakh culture differs in several ways from the Mongolian culture. Mongolian Kazakhs are Muslims. Until the end of the 1990′s there were practically no mosques at all in Bayan-Ulgii. Places of Islamic worship only sprang up a few years ago in the villages and settlements. 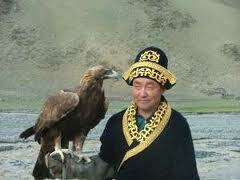 One of their interesting tradition among Kazakh is they use golden eagle and falcons for their hunting. During winter months they take their Golden Eagles out to hunt for small animals for fur and meat. This is an old tradition, which is celebrated as festival of horsemanship, hunting skills and knowledge. In the beginning of October, hunters from all over Bayan-Ulgii province gather to celebrate this traditional skill and compete against each other challenges that show off the abilities of both birds and their trainers. Prizes are awarded for the fastest eagle, the best traditional Kazakh dress and more. Hustai National Park is 95 km far from Ulaanbaatar city, to the west. 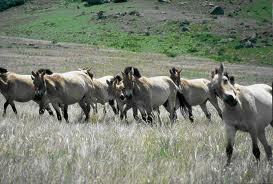 It is located in Hustai National Park which is targeted area for the project of conservation of Takhi, unique wild horse. This National Park is a fine example of the wide river valleys separated by hilly terrain that characterize forest steppe. There are dozens of wild animals such as wolves, deer, and Przewalski horse which was reintroduced in 1990 with a cooperation of the Foundation Reserves for the Przewalski Horse and the support of Dutch Government. Khamar Monasterywas established in 1820’s by famous Mongolian educator and literary figure Danzanravjaa who was living in the19th century. The Monastery was an important centre of the Buddhist “red sect”, and seat of the Gobiin Dogshin Noyon Khutagt (“Terrible Noble Saint of the Gobi”). An outspoken critic of the society in which he lived, Danzanravjaa fought against the rigid class and gender distinctions of his day. He devoted great efforts to the cause of public education, which he promoted at Khamar Monastery through the establishment of an inclusive public school, theatre, museum and library. Danzanravjaa chose the site of the monastery believing the surrounding area radiated with a spiritual energy fostered by the Gobi desert. Today Khamar Monastery is well known by World Energy Center and became one of the best attractive places of Mongolia. Near this site you visit to Bayanzurkh Khairkhan Mountain. The mountain is also a great one which is named Wish Mountain, Bayanzurkh khairkhan. Tuvkhun Monastery is one of Mongolia’s oldest Buddhist monasteries and located on a rocky mountain hill surrounded by forests in the territory of Uvurkhangai province and Arkhangai province. It is 450 km from Ulaanbaatar. Enlightened Bogd Gegeen Zanabazar chose the place to build a monastery in 1648, when he was 14 years old. The construction of the monastery started in 1651. Zanabazar, who was a gifted sculptor, painter, and musician, used the monastery, originally called Bayasgalant Aglag Oron (Happy Secluded Place), as his personal retreat over the course of 30 years and while there created many of his most famous works. It was also where he developed the Soyombo script. The monastery was destroyed in 1688 by Oirad Mongols during one of their many military campaigns against Eastern Mongols. In 1773, the monastery restored. In 1992, it was taken under the state protection. There are historical monuments related to the king such as finger and foot prints, branch for rest, horse tie etc. There is also a small cave named “Mother’s abdomen”. The Mongols still protect this unique landscape as naming it as a “Country of Makhagal”. Khorgo – Lake Terkhiin Tsagaan is situated in Arkhangai province, 650 km northwest from Ulaanbaatar. 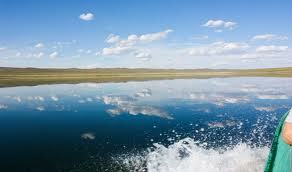 Terkhiin Tsagaan Lake is a spectacular and beautiful lake with crystal clear water. The lava flows of Khorgo Volcanic eruption blocked the north and south Terkh Rivers and formed this beautiful Terkhiin Tsagaan Lake. It extends over 16 kilometers long and reaches 20 meter depth for a total surface of 61 square kilometers. Terkhiin Tsagaan Lake itself, birdlife and mountains are now protected within the national park’s restriction. Khorgo Volcano – is located on the northern part of Khangai Mountain Range at an altitude of 2965m above sea level. Khorgo volcano is dead volcano covered with basalt. 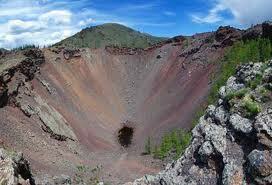 The volcano crater of the Togoo Uul is 200m wide and 100m deep. Long ago, the volcanic lava flooded in the nearby valleys, which are covered nowadays with varieties of fruits and flowers. In the forest there are many deer, wild goats and other mammals, as well as various birds. Lake Khagiin Khar is a remote lake hidden in the deep interior forests of the Khan Khentii Strictly Protected Area, part of the Khentii wilderness northeast from Ulaanbaatar. It is Mongolia’s only true wilderness in the sense that it is completely devoid of people and domestic animals. It is a realm of wolves, moose, red deer, gazelle, wild boar, lynx and brown bear. It is very rare to see any people during the journey in this area. The Tuul River originates close to Lake Khagiin Khar, eventually winds its way through Ulaanbaatar and finally drains out to the north into the Selenge River. 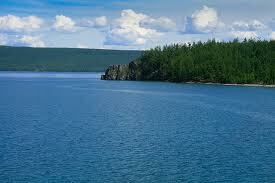 In turn feeds two-thirds of its water into Lake Baikal, which ultimately empties into the Arctic Ocean. A couple of kilometers away the Kherlen River originates. Lake Ugii is situated in Ugii Nuur soum in Arkhangai province, 1337 meters above the sea level. It covers 25 square kilometers, 7km long, 5km wide and is known for its reach bird and fish diversity. The fish population is represented by pike and catfish which are the most common types providing enough fish for industrial fishing. Among the birds, it is not rare to spot at Swan Goose, White Spoonbill and Dalmatian Pelican. Lake Uvs is located in the west of the country, 1336 km away from Ulaanbaatar. This lake belongs to the area of Uvs province Therefore the province is named after Mongolia’s biggest lake – Uvs Lake or in Mongolian Uvs Nuur. 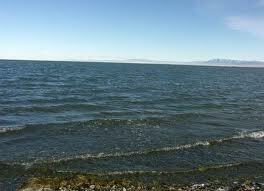 It is the largest lake in Mongolia by surface area, covering 3,350 km² at 759 m above sea level. It is very famous stone salt and various species of fish. The rivers which are named Tes, Nariin, Sagil, Borshoo and Hondlon flow to this Lake. Altai Mountains It is one of the most picturesque national parks in the world, complete with lakes, steppes, a glacier, and the highest peak in Mongolia. It belongs to area of Altai Tavan Bogd that is the highest mountain in Mongolia. It covers 6,362 km². The meaning of the name is Five Saints of Altai. This mountain is located in the Bayan Ulgii province. The Huiten Peak is the highest point of Mongolia at 4374 meters above sea level. Besides Huiten peak, the mountain includes four peaks as Nairamdal, Malchin, Burged and Ulgii. The Nairamdal Peak forms the border between Mongolia, Russia, and the Xinjiang province of China. Altai Tavan Bogd National Park includes the lakes Khoton, Khurgan, and Dayan. The protected area offers a home for many species of alpine animal, such as the Argali sheep, Ibex, Red deer, Moose and Golden eagle. The national park with its amazing beauty embodies the special characteristics of high mountains, icy crystal rivers, mountain valleys, steppe landscapes and ecosystems. Things to do here include climbing, fishing, mountain trekking, camel and horse trekking, and learning and experiencing about the Kazakh culture. 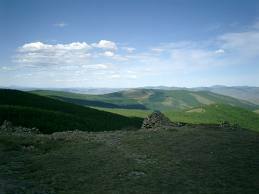 Khangai Mountains Khangain Nuruu National Park preserves the best representative area of the Khangai mountain range and its biodiversity. 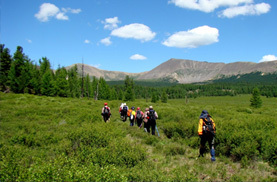 The Khangai mountain range supports a variety of habitat types, ranging from steppe through taiga to alpine vegetation. Mountaintops are rounded, with bare or rocky peaks, some with alpine meadows and lakes. The forests are mostly larch and pine but mixed forest is common. Steppe vegetation is found in the foothills. Many large rivers originate from the Khangai mountains and, at lower elevations, these are flanked by dense riparian forests. Khentii Mountains It is the birthplace of Chinggis Khaan. 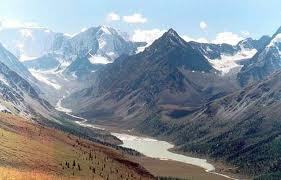 Khan Khentii is covered with forests, taiga and mountain forest steppe. It is the land described in the Secret History of Mongols, a literary monument of the nation and is a protected area. 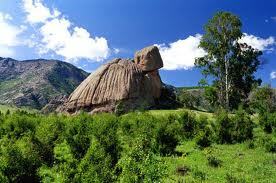 It is located in the north- east of Mongolia. There are numerous streams and rivers which are the sources of the Tuul, Herlen and Onon Rivers, just kilometers from each other. In this sense, this source of rivers is the watershed of Asia. Orkhon waterfall is called Ulaan Tsutgalan, was formed by a unique combination of volcanic eruptions and earthquakes about 20 000 years ago. The Ulaan Tsutgalan waterfall is the biggest in Mongolia at a height of 26 m. The Orkhon river has many species of fish like the pike, Siberian sturgeon, taimen, asian common asp, Siberian grayling, roach etc. The Orkhon river Valley has been protected since 2006 as a National Park. Chinggis Khaan Statue complex is located in “Tsonjin Boldog”, a historical place where Chinggis Khaan found his golden whip. The statue was created as a memorial to the Man of the Millennium “Chinggis Khaan”. 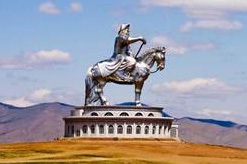 The 40 meter high stainless steel statue of Chinggis Khaan on the horseback is the largest of its kind in the world. Recreation area, restaurants, souvenir shop and conference hall occupies the base structure, from here visitors can climb to the top of the horse’s head and have a farseeing and panoramic view over the complex area. It is 45 km from Ulaanbaatar. The 13th Century Theme Park is located at 110km in the east from Ulaanbaatar and 20 km from Erdene Soum, Tuv Province. The park is the only place you can visit the old time micro kingdom of the 13th Century and experience the genuine way of living and working during that time. Park visitors can enjoy craftsmen art work, Mongolian calligraphy, learning to write Mongolia traditional scripts, trying on traditional Mongolian clothes, riding a horse and a camel and taking a lot of unforgettable photos. “13th Century National Park” consists of five camps and tribes that are mentioned below. It is the main attraction point of XIII century National Park. You get know about the statecraft of XIII century Mongols. All the state affairs such as declaring the laws, holding a great forum are carried out at the camp. In the King’s Palace, different programs and receptions are organized. One of them is King’s Great Feast. Here, you are able to have Mongolian traditional cuisine and beverage while you are enjoying Traditional music. Also here it is chance to wear on kings’ or queens’ costume. Blacksmiths and the craftsmen work of XIII century Mongolians were very popular in the World. In the craftsmen camp you enjoy seeing the craftsmen art work such as horse hold utensils, women’s ornaments, jewelry, arms and tools etc. Having visited to the complex you are amazed by their works, woolen felt items, and handmade carpets. By visiting this camp you have an opportunity to get know about the unique culture of the literacy, traditional way of educating their successors and young. Besides, tourists and guests are offered practicing in Mongolian calligraphy. You can have experience of herders’ everyday life, pastoral cultures, the way of breeding the livestock, the methods of producing dairy products, horse training and catching with lasso pole, tanning the leather straps, riding horse and yak, camel here. 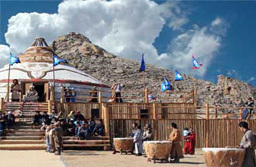 Following the customs of each clan, the Shamans of Mongolian different clans gather around fireplace under one common sky and perform a ritual to worship unanimously aiming for one common deed. You can see several kinds of Shaman ritual of worshiping, such as worshiping for 33 heavens, cairn and big fire.